Is this sign on public/private property? Got a ticket for failing to obey this "no left" sign. 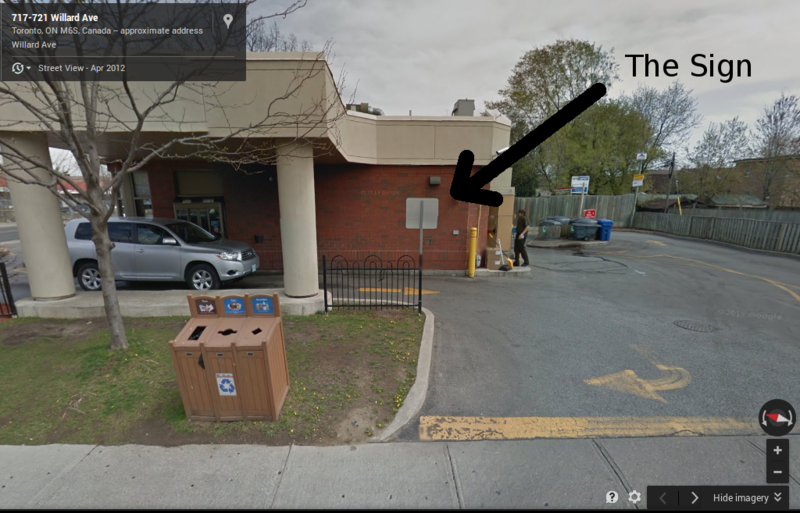 It's attached to the Tim Hortons in Toronto, it's hardly noticeable when leaving the drive-through. How can I find out if this sign is a private or public? Re: Is this sign on public/private property? I'd say the one shown in your photo is on private property, but the one across the road on the utility pole is lawful and enforceable. OK - from what I can tell this relates to section 139 (1) about leaving a private road onto public highway. This states you can enter so long as it does not constitute any hazard. (2) Subsection (1) does not apply to a driver or operator entering a highway from a private road or driveway controlled by a traffic control signal of a traffic control signal system. R.S.O. 1990, c. H.8, s. 139 (2). Left turn sign != "traffic control system"
Are these are the parts of the highway traffic act that dictate what laws you have to follow when entering a highway from a private road? 139. (1) Every driver or street car operator entering a highway from a private road or driveway shall yield the right of way to all traffic approaching on the highway so closely that to enter would constitute an immediate hazard. R.S.O. 1990, c. H.8, s. 139 (1). Definitions of "traffic control signal"
What section of the HTA were you charged under? From your picture, I couldn't see the 'no-left' sign on the utility pole referred to by Stanton. However, Google maps cleared that up. Stanton is correct. Your left turn would be in violation of THAT sign since that sign conforms to the rules of the HTA, which applies to all motor vehicles entering the 'highway' (i.e. public road) from the parking lot. Unless exempted otherwise, as soon as you're on the 'highway', the HTA rules apply to you. There are no specific provisions exempting persons entering from private property. Signs (9) The provisions of this section are subject to any sign, as prescribed by the regulations, forbidding a left turn, right turn, through movement or combination thereof that is posted at an intersection and every driver shall obey every such sign. R.S.O. 1990, c. H.8, s. 144 (9). So, the sign is valid at an intersection. Is a private road -> highway considered an intersection? According to the HTA I'd say it isn't. What do you guys think? Is it possible to make the leap that the traffic control sign posted from a private road -> highway also isn't enforceable via the HTA? Traffic control signs, EXCEPT for those defined in section (2) "traffic control signal" a.k.a a stop light with red/amber/green are unenforceable. What section were you actually charged under? I'm guessing section 182. Section 139 applies when leaving a private driveway (which you were) but you're still required to obey any posted signs as per section 182. Section 144 would not apply since there wasn't any traffic control. Yes - you are correct I was charged under 182 (2). I think its already accepted that 182 (2) does not apply to private signs posted. So, although 182 (2) states all signs posted - it clearly is not enforceable as all signs posted. Also, from my notes above, the highway traffic act (with regard to signage) clearly is meant to apply to the highway. The sign posted (no left) was giving direction from a private driveway - something the act (maybe?) does not cover. Could it be argued if the HTA was meant to regulate traffic existing a private driveway - section 139 would not be required, nor the exception to subsection (1), as would it not already be covered by 182 (2)? Additionally, if subsection (1) would not be so exact as to specifically mention "traffic control signal of a traffic control signal system" if the HTA meant to apply? Just to be more clear - according to the highway traffic act, a "No left" sign means no left when "posted at an intersection". It was not posted at an intersection, and therefore does not mean no left according to it's definition in the HTA. Are you trying to argue that as a whole the HTA doesn't apply to those exiting from a private road/driveway on to a "highway"? Or are you arguing that signs that are not on "intersections" are not enforceable? Or are you arguing that without specific provisions dealing with existing from private roads, no rules apply? Its getting quite hard to figure out what your argument(s) are. 182 (2) states you must obey the instructions of all signs errected. So, what sign did I disobey? "forbidden left turn"
(9) The provisions of this section are subject to any sign, as prescribed by the regulations, forbidding a left turn, right turn, through movement or combination thereof that is posted at an intersection and every driver shall obey every such sign. R.S.O. 1990, c. H.8, s. 144 (9). So, "forbidden left turn" signs have a clear definition of "that is posted at an intersection". Wasn't posted at an intersection, did not disobey the defined "forbidden left turn" sign as defined by the HTA. It's like if they said, "everyone driving a red sports car" instead of "that is posted at an intersection". (9) The provisions of this section are subject to any sign, as prescribed by the regulations, forbidding a left turn, right turn, through movement or combination thereof that is posted while driving a red sports car and every driver shall obey every such sign. R.S.O. 1990, c. H.8, s. 144 (9). I wasn't driving a red sports car (disobeying the sign at an intersection) - so I wasn't disobeying the sign. Wasn't an intersection. Wasn't disobeying the sign by definition. It appears you're cherry picking subsections of the HTA to try and justify a properly laid charge under section 182(2). What section of the HTA is (9) from? I now figured out what you're doing: you're attempting to import the definition of "sign" in section 144(9) to section 182(2). However, this is contrary to the principles of statuory interpretation. They are independent provisions and offences. Section 182(2) is not restricted by the same "intersection" limitation you are trying to argue. It was a creative attempt however. Agreed, you can't cherry pick sections of the HTA. And as for the argument it's on private property, you still have a sign across the street that clearly isn't. So even if you could legally ignore the sign in the parking lot, the other sign still compels you not to turn left.